I guess the similarity of Tofu Fa or Tau Foo Fah's texture and smoothness made Kak Nor to title her dessert as such. 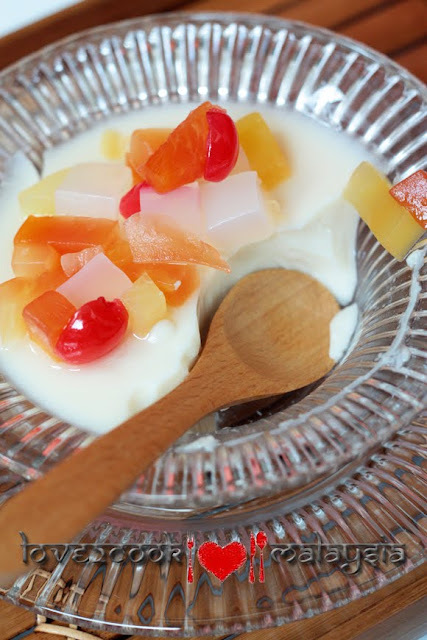 This pudding is truly milky, guess why...b'coz it has mixture of coconut milk, evaporated and condensed milk. 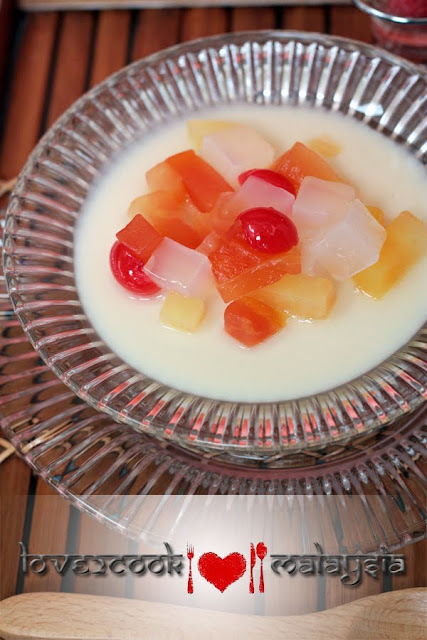 Serve the pudding chilled with fruits cocktail / lychees / any fruits! I forgot the whole world when scooping it! In a separate bowl, combine coconut milk, condensed milk and evaporated milk. Leave aside. In a bigger saucepan, bring to boil water and agar-agar strips until dissolved. Add sugar and screwpines leaves. Add the milk mixture and stir until few boils. Turn off heat immediately. Leave the mixture to lukewarm. Pour into prepare small glasses/ramekins/bowls/moulds. Allow to cool before chilling until the pudding sets. Add chilled fruits with some sugar syrup before serving. 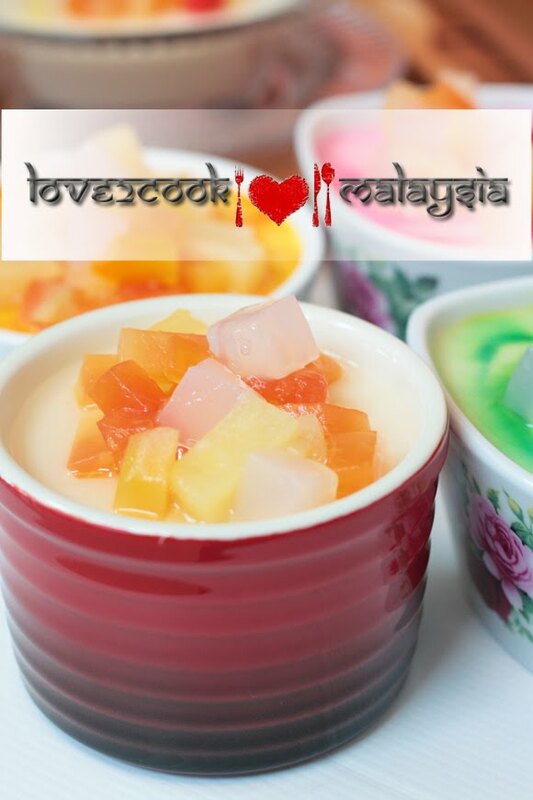 * Kak Nor originally topped the pudding with lychees and sugar syrup, I used canned fruits cocktail and the syrup. * I added drops of colouring to make the pudding more inviting, thanks Rishie for the idea! colourful...kids sure love this pudding..thanks for the idea love. Morningggggggg Sweet LOVE!....hrrrmm yummy...maybe I should make yhis for dessert today....hehehe....everything looks yummy...tambah2 tengah puasa ni!...Love & Kisses to the kids! Lovely picture. The mini porcelain bowl is very cute. Looks extremely delicious! Love it. Is evaporated milk same as mava? 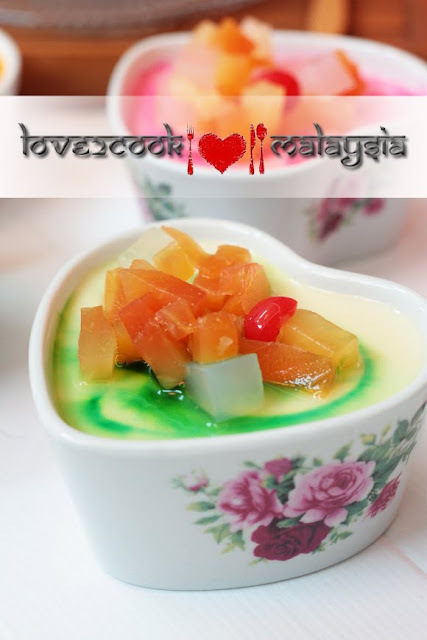 hai love... wahhhh sedap ni klu dibuat dessert mase berbuka yek...nice picas! Hi Love.. Long time no see..hehehe..
Nampak sedap sangat dan menyelerakan.. Bila la nak buat.. Esok kot..hehehe..
Wow! Very yummy and pretty looking desserts! I would really, really love to dig into these! Mmmmm....yum! Love..U always make me drooling..walaupun tgh malam ni haaa..!cantikkk!! Very colorful and extermely tasty looking pudding. Amazing preparation. 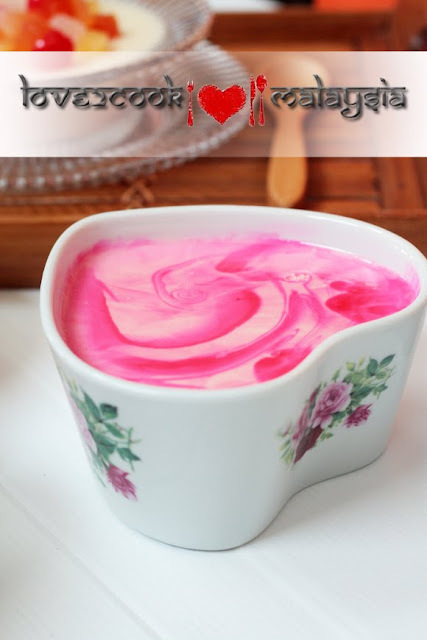 waah cantiknya puding tauhu tu love.... puding nie mmg sedap sesgt kan ... terbaik! Love the combination of the coconut milk and the condensed milk. Great flavors in your dish. This looks like a brilliant idea with agar. Lovely shots too!! WOW! That looks good! I have never tasted anything like this before :) Curious what it'll taste like! Hi Love.... miss you! Long time no bw... sorry abt that. Time so limited nowadays. Hope you & kids are doing well. can almost taste the cool smoothness of the pudding. and beautifully taken too! Hey Love Darling.. Ahh... Wonderful Dessert.. So simple and elegant.. I make Agar Agar.. but never thought of topping it with fruits..
Would love to have this beautiful dessert sent to my ongoing event.. 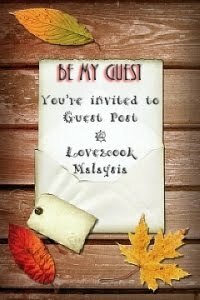 Check it out.. and send ur entries..